You Are Here: Home > 2019 INFINITI Q70 vs 2018 INFINITI Q70 | What’s the Difference? 2019 INFINITI Q70 vs 2018 INFINITI Q70 | What’s the Difference? The 2019 INFINITI Q70 is an exciting new car that’s sure to appeal to many kinds of luxury shoppers. Like the 2018 Q70, this is INFINITI’s flagship sedan. Craftsmanship and style create a heightened air of luxury. Performance wraps up the package, pleasing the driving enthusiast. Building on last year’s favorite features, the 2019 Q70 LUXE comes with a Bose 10-speaker premium audio system. Active Noise Control puts two microphones in the ceiling. If certain noise levels are reached, the ANC will act to reduce the level of road noise in the cabin. The INFINITI eight-inch touchscreen provides Bluetooth streaming audio. Navigation is standard. This system includes 3-D building graphics and lane guidance. To help with parking, Luxe models have the AroundView Monitor. It shows you multiple views of your surroundings, giving drivers the best chance of seeing obstacles and people. Moving object detection makes this the best system on the market. The 2018 INFINITI Q70 came packed with standards. For 2019, INFINITI is doing even more. Replacing leatherette, leather is standard on the LUXE model, and aniline leather is available for upgrade. Either one provides rich, long-lasting comfort. Climate-controlled seats and a heated steering wheel are new standards. Drivers will appreciate a dual memory system. This controls the driver’s power chair, power steering wheel, and power mirrors. INFINITI gives you an entry/exit system that makes it easy to get in and out of the vehicle. Once you are aboard, the chair and steering wheel can return to your preset positions. The INFINITI Intelligent Key knows which driver has arrived. It can also provide the last navigation, audio and climate settings. Shoppers will like the many options that were introduced last year and continue this year. Fine touches include a stitched meter hood, Japanese Ash wood and a suede-like headliner. Racy elements include bolstered sport seats and a sport steering wheel with magnesium paddles. There are many crash avoidance systems on the menu, including a Backup Intervention System. The unique INFINITI forward collision system can detect stopping traffic further ahead and slow the vehicle down sooner. These sedans are powered by a 3.7-liter V6. Drivers command 330 horsepower. The 2019 edition has almost 90 more horses than the Lexus GS, BMW 5 Series, or Mercedes Benz E-Class. It beats the Audi A6 by 80 horses and slips by the Acura RLX with 20 more horses. 2019 Q70 horsepower is controlled by a seven-speed automatic transmission. Rear-wheel drive gives drivers that racy feel. All-wheel drive offers an all-weather European approach to driving challenges. If you want something even speedier, the V8 provides 420 hp and 417 lb.-ft of torque. Speed-sensitive steering helps correct for over- or understeer. 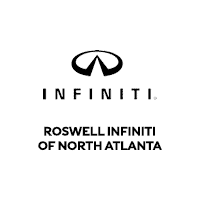 Now that the 2019 INFINITI Q70 is here, come test drive your favorite color and trim at Roswell INFINITI.